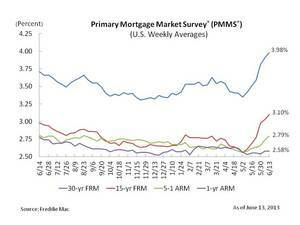 MCLEAN, VA--(Marketwired - Jun 13, 2013) - Freddie Mac (OTCQB: FMCC) today released the results of its Primary Mortgage Market Survey® (PMMS®), showing fixed mortgage rates climbing higher amid a solid employment report for May. Since beginning their climb last month, the 30-year fixed-rate mortgage has increased over half a percentage point. Regardless, mortgage rates are coming off their all-time record lows, which is helping to keep homebuyer affordability high. 30-year fixed-rate mortgage (FRM) averaged 3.98 percent with an average 0.7 point for the week ending June 13, 2013, up from last week when it averaged 3.91 percent. Last year at this time, the 30-year FRM averaged 3.71 percent. 15-year FRM this week averaged 3.10 percent with an average 0.7 point, up from last week when it averaged 3.03 percent. A year ago at this time, the 15-year FRM averaged 2.98 percent. 5-year Treasury-indexed hybrid adjustable-rate mortgage (ARM) averaged 2.79 percent this week with an average 0.6 point, up from last week when it averaged 2.74 percent. A year ago, the 5-year ARM averaged 2.80 percent. 1-year Treasury-indexed ARM averaged 2.58 percent this week with an average 0.4 point, the same as last week. At this time last year, the 1-year ARM averaged 2.78 percent. "Fixed mortgage rates crept up further this week following a solid employment report for May. The economy added 175,000 new jobs and the number of discouraged workers fell by 780,000 to the fewest since September 2009. And although the unemployment rate ticked up to 7.6 percent, it was due to a 420,000 increase in the size of the labor force; the underemployment rate fell from 13.9 to 13.8 percent in May. "With the ongoing run up in fixed mortgage rates, adjustable-rate mortgages (ARMs) are becoming more popular among homeowners looking to refinance and for home purchasers. The 30-year fixed mortgage rate this week is 0.6 percentage points above the recent low set over the week ending May 2nd. In comparison, the share of conventional mortgage applications for ARMs rose from 13 percent of dollar volume at the beginning of May to 17 percent last week, according to the Mortgage Bankers Association."